Although Hinduism is the third largest religion worldwide, not much is known about the customs & beliefs of the Hindu religion. And this goes for what goes on at a Hindu funeral ceremony. This guide will cover their beliefs about death, and the rituals carried before, during, & after it occurs. 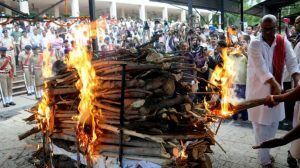 It will discuss how Hindus handle the cremation process, and the differences between a funeral taking place in India than in the Western World. In addition, we will explain what to expect at a Hindu funeral and give you some recommendations on etiquette when attending one. As believers of reincarnation, Hindus follow the idea that it’s only their body that dies. The soul is reborn in a different form after death. This recycling of life continues until the soul finds it’s true nature. This is referred to as Brahma, which is their one God. 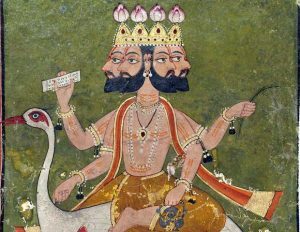 Brahma has many forms. There are thousands of gods and goddesses that contain a part of Brahma. Many Hindus choose one or more of those gods to serve and worship. This process can take many lifetimes. Therefore with each death, they strive to move closer to Brahma. They believe that when the body dies, the soul departs through the top of their head. It then lives on in a different form after a regrouping. That form can be human, animal, insect, or even plant. Hindus are avid believers of karma. They feel that by suffering, they cancel out past negative deeds. This is accomplished by fasting, confession, and intense prayer, to name a few. Hindus are frequently seen with their heads shaved, which is a way for them to make sacrifice. Their karma helps to determine the form in which they are reborn in the next life. A Hindu’s journey to death is multifaceted and has numerous stages. It sometimes begins before death and continues for a period of time after death, which we will explain later. If it’s apparent that death is coming soon, there are a few preparations to be completed if possible. Some rites are completed by a priest, but the majority are performed by the family. If possible, a Hindu should die in their home with their loved ones. If they are hospitalized and death is imminent, ideally they are brought home. When death is about to occur, they are normally placed on the floor with a grass mat and a priest is summoned. They should be positioned at either the home’s entry or in their room, with their head toward the east. There should also be a light at their head. The priest and the family assemble around the dying person. A small amount of water, from the Ganges River if possible, is placed into the dying person’s mouth. Family members sing hymns, recite prayers, and chant the dying person’s mantra. A mantra is a distinct syllable or word, usually chanted repeatedly, which brings about clear and positive thoughts. The person is urged to concentrate on their mantra. This is meant to bring all their energy to the top of their head. As they die, they should think of Brahma and other happy thoughts, such as their family. These thoughts will aid the soul in leaving the body at the highest state. If it’s not possible to put the water into the deceased person’s mouth before death, it should be done immediately after their death. Everyone must ensure that they do not touch the body any more than necessary. They perceive it as impure. If the person is unconscious at the time of death, their mantra should be softly spoken into their right ear. The body is then placed with the head toward the south and incense is burned. 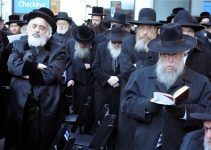 In some sects, a cloth is placed under the chin and tied to the top of the head. Their big toes and are tied together as are their thumbs. Religious pictures are turned toward the wall and mirrors are sometimes covered. As mentioned, there may be some variations in this process, depending on the sect. Ideally the deceased should be cremated before the next dusk or dawn, whichever comes first. In most traditions, the chief mourner passes an oil lamp over the body. He or she then removes the clothes of the deceased and wraps the body in a white cloth. The chief mourner is typically the oldest son if the departed is a father, and the youngest son if the mother. After that, sesame oil is applied to the body and then bathed with water. The body is redressed and placed in a coffin. The younger children may encircle the body with small illuminated sticks while singing hymns. The women place rice into the mouth of the departed for nourishment during their journey. If the deceased is a man, the wife places the wedding pendant around his neck and the coffin is then closed. At that time, the body is removed feet first and transported to the cremation site. Hindu funeral rites have many variations, so keep in mind that other versions of the following ceremony are possible. 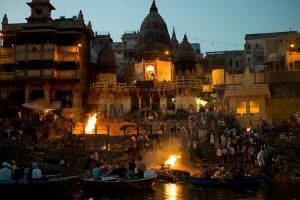 If the cremation takes place in India, it is generally performed near the Ganges river. The casket is occasionally transported to the cremation site by vehicle, but is commonly carried by foot. In most sects, only men are present at the cremation. The mouth of the departed is again filled with rice, by the men this time. Coins are sometimes placed over the eyes. The site is typically a pyre made of wood and straw with a platform on top, where the deceased is placed. The body is carried around the pyre three times counter-clockwise, and then placed on the platform. If in a casket, the cover is removed. The chief mourner again circles the pyre three times with a clay pot of water on his left shoulder, and a burning torch behind his back. With each circle, someone knocks a hole in the clay pot, which allows the water to pour out. This signifies that life is leaving the vessel. After the third circle, without facing the body, the chief mourner lights the pyre. It is the most polluted river in the world, due in a large part to the thousands of cremations performed there. Sometimes as many as 200 a day. It’s littered with bodies and cremated remains. 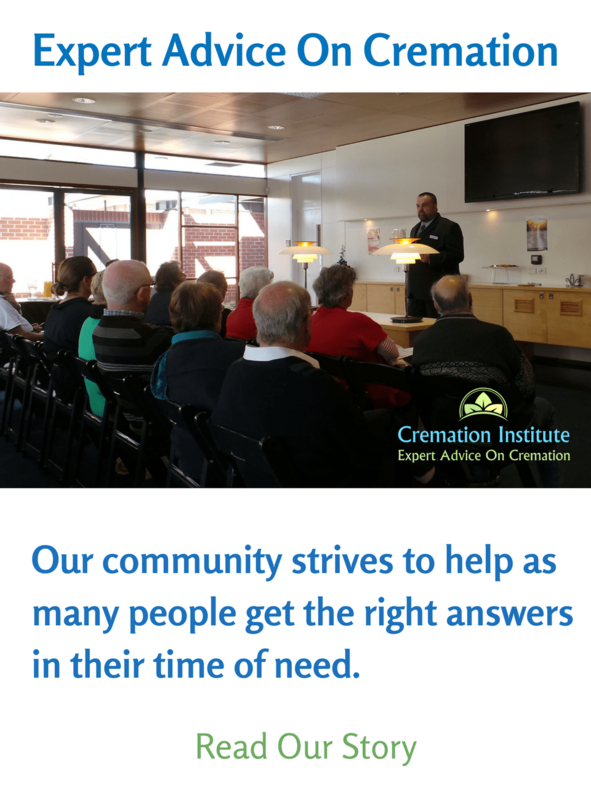 In the USA, the cremation must be performed in a crematorium, therefore a revised ceremony has to be arranged. Surprisingly, it’s not extremely different. Most crematoriums allow the ceremonies and rituals to be performed before the cremation. The body is carried into the facility feet first and toward the south, if possible. The circling of the body is also typically performed. Subsequently, instead of the chief mourner lighting the fire, the body is then placed into the cremation chamber. 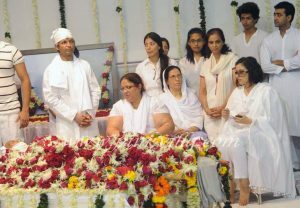 Some facilities allow the family to place ghee and sacred wood inside the coffin. A number of crematoriums even allow a fire to be lit in the coffin, proceeding the cremation. If the person is hospitalized and it’s not possible to bring them home, the same procedures as in “Close to Death” are performed there. When attending a Hindu funeral, many people are unsure of what to expect, how to act, and what to wear. Below are a few tips on Hindu funeral etiquette. It’s important to note that the proper attire is quite different than at most funerals. Wearing the color black to a Hindu funeral is not appropriate. The color white is vital in the Hindu culture, so that would be the best color to wear. The attire is casual and respectable. Women should keep hemlines and necklines modest. Arms should be covered and open toe shoes are appropriate. You do not need to wear a head covering. Men should dress in a white shirt. Do not bring flowers to a Hindu funeral. Flowers play an important role in the ceremony, but not in the usual sense. Everything leading up to the cremation is considered the last chance for the family to assist with the soul’s transition to the next life. Flowers being delivered or brought to the funeral would be considered a distraction and could cause harm to the soul of the deceased. When a Hindu is dying, they strive to attain the greatest state of consciousness possible. 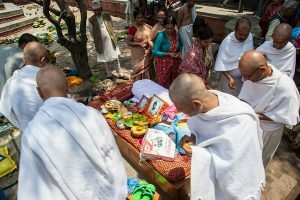 The family recites mantras and Hindu prayers, while they focus on the top of the deceased’s head. 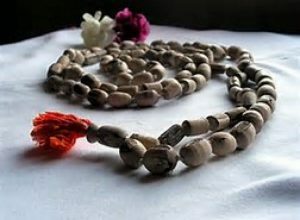 Additionally, they frequently use a mala, which is a string of beads intended to keep them focused on their prayers. Although cremation tends to be prevalent, burial is much more common than most people think. It’s actually the preferred method in some locations and sects. Most times, the purpose of cremation is to purify the person before beginning their passage to their new life. 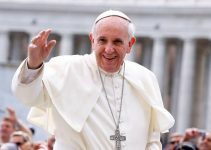 Nevertheless saints, infants, and young children are already considered to be pure and are typically buried. In India, burial is more commonplace in the south. Also the more rural areas tend to bury their dead as well. If you have an opportunity to visit a Hindu cemetery, you may be surprised by their appearance. The graves that have markers, are frequently painted in vibrant colors. To hinder the growing problem of overcrowding, some graves are not marked. That way, another person can be buried in the same plot later. The death of a Hindu person is a lengthy and complicated journey. 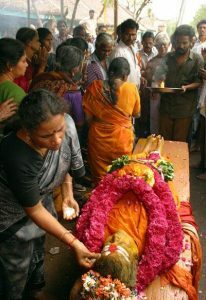 Although excessive mourning is inappropriate, there is an extended period of rituals and ceremonies after the cremation. The mourning period begins after the cremation and usually lasts 13 days. Upon the completion of the cremation, there is a phase of ritual impurity. Everyone returns home, bathes, and cleans the home. A water pot and lamp are placed where the body was located. The water is changed every day. The family does not leave the home for a period of time, which varies between the different sects. It’s sometimes for as long as a year, but usually much less. The family is not allowed to prepare meals for at least one day after the cremation, therefore, relatives bring prepared food to the home. Excessive mourning is avoided and a happy environment in the home is encouraged. They believe the soul of the departed is still conscious of any emotions on their behalf. Excessive mourning can inhibit them in their transition. In some sects, it’s even dishonorable to cry over the dead. A memorial ceremony is held on either the third, fifth, seventh, or ninth day, when relatives have a meal of the deceased’s favorite food. A plate of the food is placed in front of the deceased’s photo. Afterward, the plate is taken outside to a vacant place. On the 31st day, the home is cleaned and a service is conducted that basically recreates the original funeral ceremony. 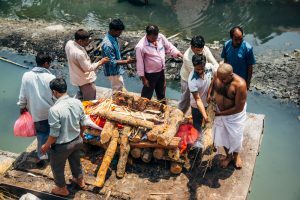 The next day after the cremation, the men in the family gather the cremated remains and scatter them in the Ganges river if possible. If outside the country, the cremains can be sent to India to be scattered in the Ganges river. In some cases, someone from the family will actually travel to India to take care of the ashes. 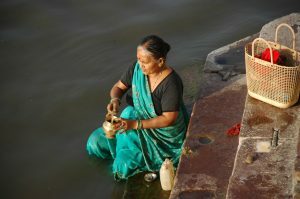 If those options aren’t possible, Hindus have begun scattering the cremains in a river or other body of water in the US. There may be some guidelines to follow. Check with local authorities to ensure the scattering is done legally. A year later, Shraddha rites are performed. This provides momentum to deceased ancestors so they can reincarnate and advance to a more superior form. This is performed every year as long as any sons of the deceased are still alive. 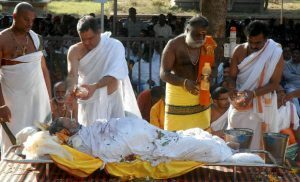 As you see, the death of a Hindu is a complex matter. 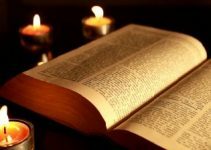 Nevertheless, we have strived to give you a basic explanation to guide you on the beliefs, customs, and ceremonies that take place before, during, and after the death of a Hindu. Hopefully, we have aided you in what to expect, how to act, and the proper etiquette. 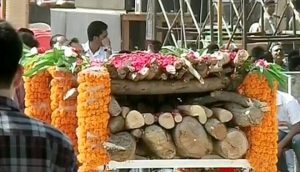 I find it cool that a Hindu cremation includes bathing the deceased’s body in sesame oil and water before it is placed in a coffin after redressing. This reminded me of my officemate’s friend who died last week. She says that his last wish is to be buried traditionally back in India, his home country. How should one find a funeral service to transport his body back there? 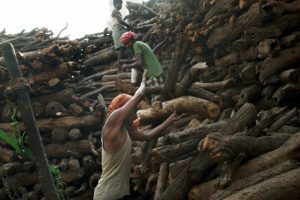 How long can Hindus hold on to the ashes before scattering them? We were looking to keep them for about a year. It’s for our mother who was a Hindu but didn’t really practice the customs stringently. The rest of us are not religious at all.